Property Size 663 sq. ft. 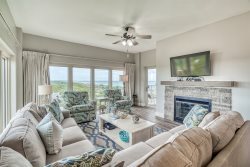 Recently redecorated and upgraded with fresh paint, all new furniture throughout, a 46'' flat screen TV, stainless fridge and new linens, our unit is among the most beautiful, tasteful condos available in all of Gulfview. We invite you to come and relax in this very special place, and enjoy all of the amenities that Gulfview has to offer. Spend a long weekend or extended stay - this condo will pamper you with every amenity needed for the perfect vacation. Beach Access within 100 yards of condo door! Add $85 for housekeeping and 11% for tax. $69 damage protection; 2.50% to process credit card payments. 25% of the total is due at booking and will hold the unit for you. The remaining balance is due 30 days prior to your arrival.